We had had a trip to Ireland with a couple of friends planned for several months. They arrived last Friday evening and we drove to Holyhead to catch the early afternoon ferry to Dublin on Saturday. The crossing was smooth and we managed to navigate our way to the hotel which is on the banks of the canal. We had a reservation at Chapter One, a Michelin starred restaurant in Parnell Square. I had eaten there many years before but none of the rest of the party had. Aside from being a little slow to take our order and one of us thinking their starter was uninteresting, it did not disappoint. The centre of Dublin was very busy as we took a taxi back to the hotel. On Sunday morning we had breakfast in a nearby cafe and then walked into town. We passed an interesting shop. It made me wonder if my local hardware shop would consider branching out. 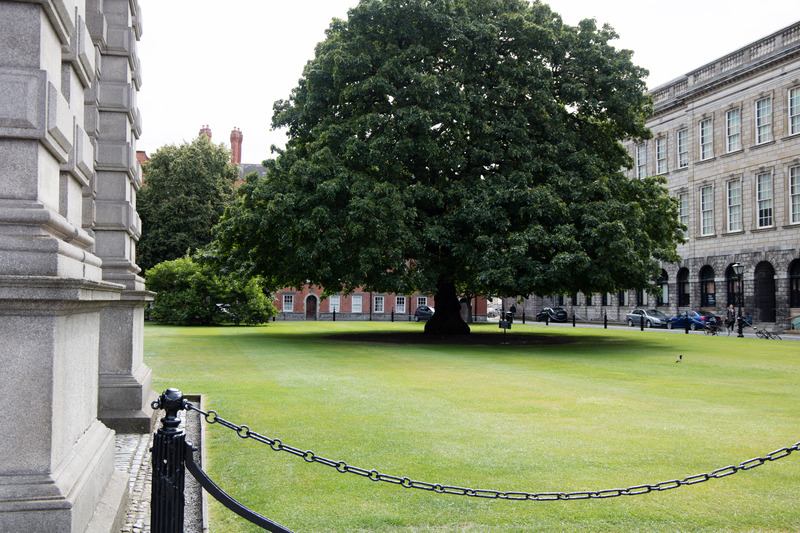 We had a look around the grounds of Trinity College but the Book of Kells exhibition needs to be booked in advance – the queue today was extremely long. We will visit the next time we are here in the autumn. The next stop was Merrion Square which is described as Dublin’s prettiest. 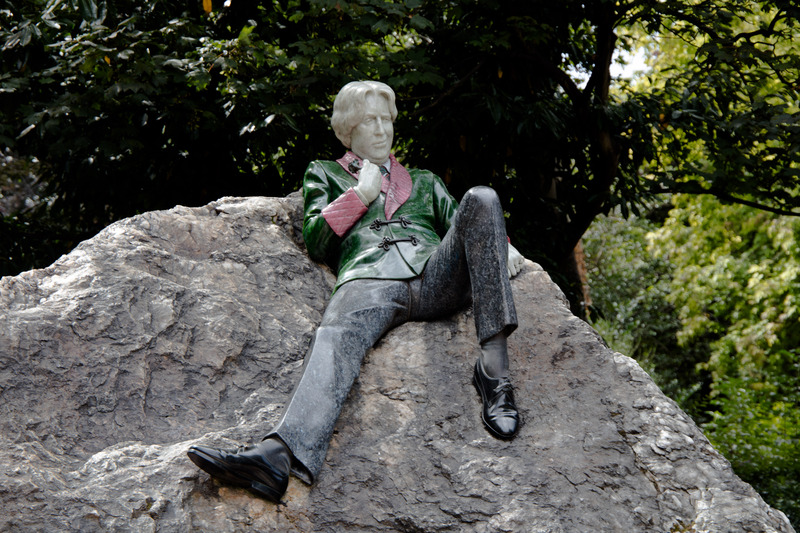 It has statues of a number of people including Oscar Wilde and is situated in the southern Georgian quarter. Later in the afternoon we walked along the canal and explored the National Art Gallery. We looked a the permanent collection which included many 16th and 17th century paintings and some more recent Irish ones plus some stained glass. There was an exhibition of the work of Margaret Clarke, a 20th century artist that I was not familiar with. We also saw the exhibition of the work of Vermeer and his contemporaries in the Netherlands who influenced him. Fortunately it was not as busy as the exhibition we saw in London the previous weekend. 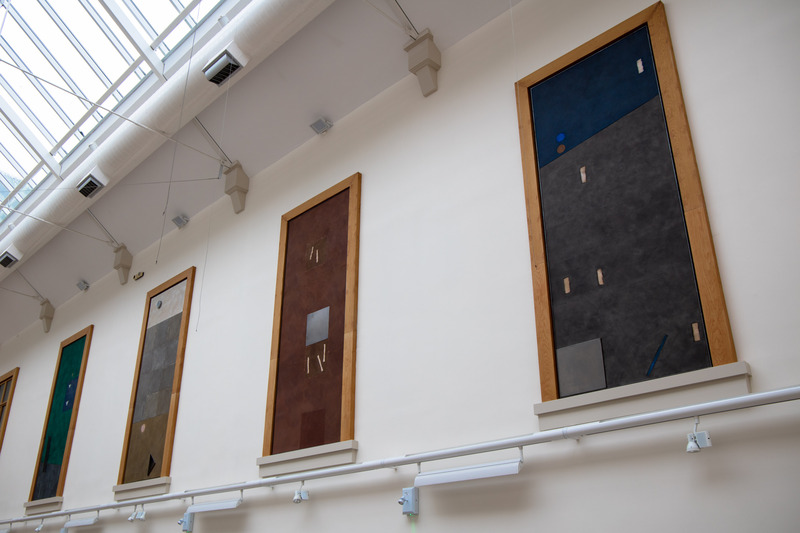 In the stairwell were these 1996 paintings of Felim Egan entitled ‘The Four Seasons’. After a couple of drinks including the obligatory Guinness in the Ha’penny Bridge Inn to escape the rain, it was time for dinner. Tonight we were dining at the Winding Stair Restaurant. 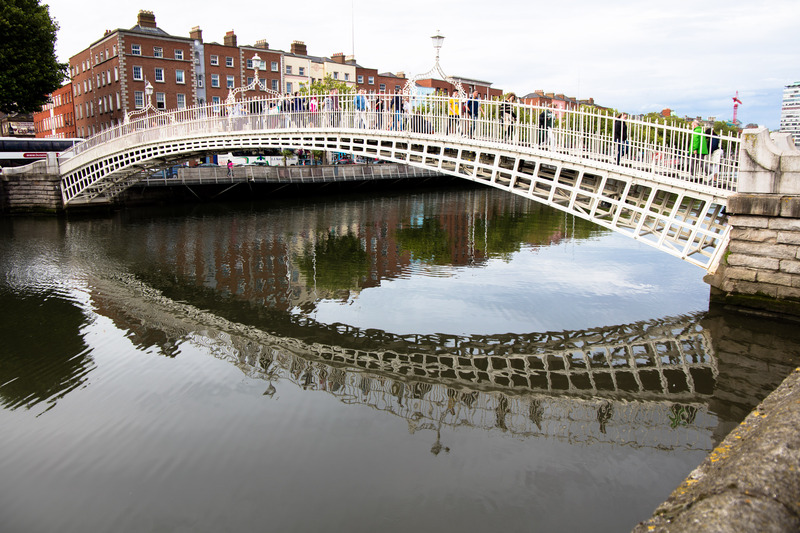 It is on the banks of the Liffey and on the ground floor is one of Ireland’s oldest independent bookshops – The Winding Stair Bookshop. Unfortunately as it was Sunday, it was closed. This meal was very enjoyable (we even sampled some Irish haggis) and finished off the evening well. I have made several notes of other places to explore on future trips. 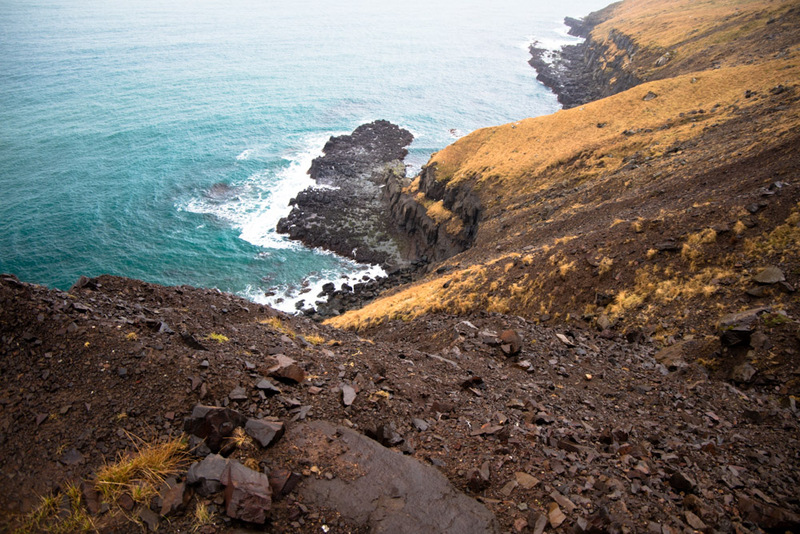 We left Eyvindur where we had stayed overnight and the Ring Road in fog and snow to explore the eastern fjords. Driving down a long valley we spotted a little red hut, one of the few remaining bothies that used to sit along all the mountain roads. We passed another hanging valley and came to the town of Reyðarfjörður which has a World War II museum as the British Army was stationed here. It is also the place ‘Fortitude’ was filmed and anyone familiar with it might recognise some of the buildings. Continuing on R96 we drove through a long tunnel under the mountain to Fáskrúðsfjörður. 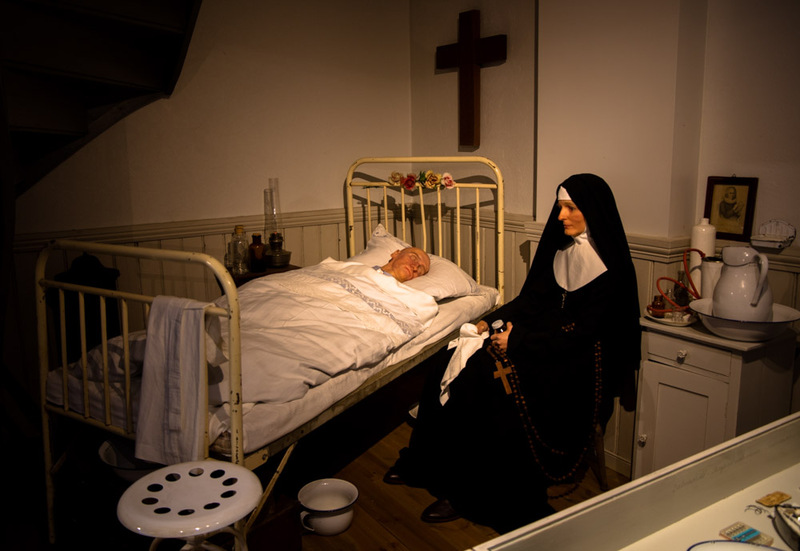 This town was settled by French fishermen in the 19th century and a museum covers their work and the French Hospital that was set up to care for them. Many of the signs in the town are in French as well as Icelandic and English and so I discovered that there is not a French word for ‘iceberg’. 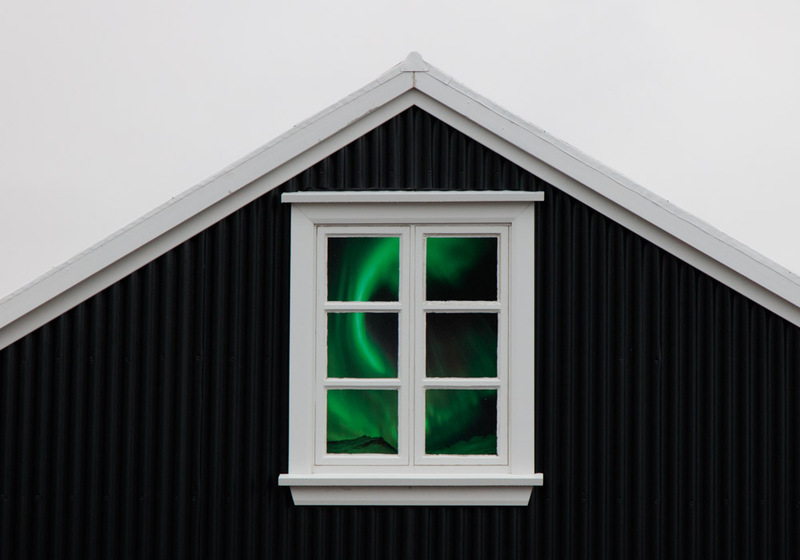 Someone also had had a better view of the aurora than we had. There were eider ducks in the harbour and in summer you can sometimes see porpoises. 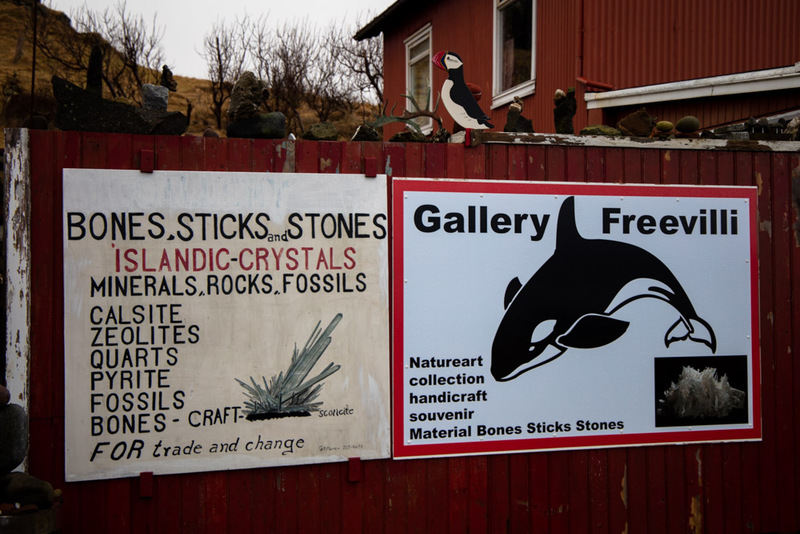 In a small village Stöðvarfjörður further on, there is a geology museum based on the lifetime collection of local stones undertaken by a woman aptly named Petra. Unfortunately it is only open May to September so we were unable to visit. The coastal road rejoined the Ring Road a little later and we passed cliffs where Herring Gulls and Fulmers nest in summer. 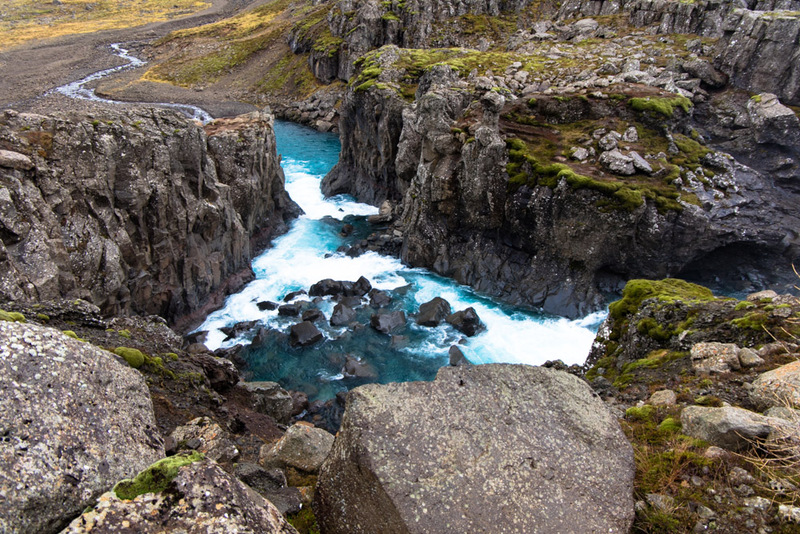 We visited another waterfall in the Fossardalur valley which is the second highest in Iceland at 122 metres. By the time we reached Djupivogur the sky was overcast and gloomy. 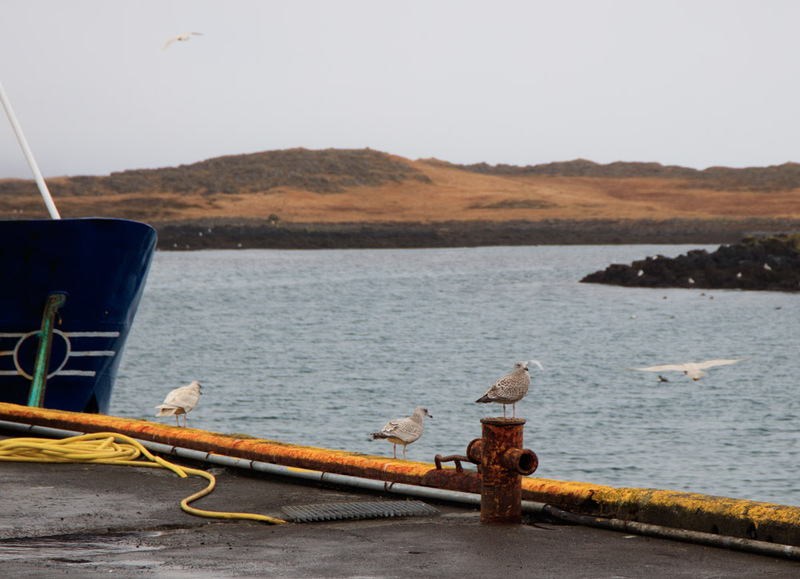 The only colour was the boats and equipment down at the harbour where these gulls had found a colourful perch. This town is one of the oldest ports and guidelbooks say that the last great excitement was when North African pirates ransacked it in 1627. Papey Island is just offshore and is inhabited by seals and birds. Boat trips run to it in summer. Down towards the jetty in the town is a place reminiscent of many we saw along Route 66: Bones, Sticks and Stones. 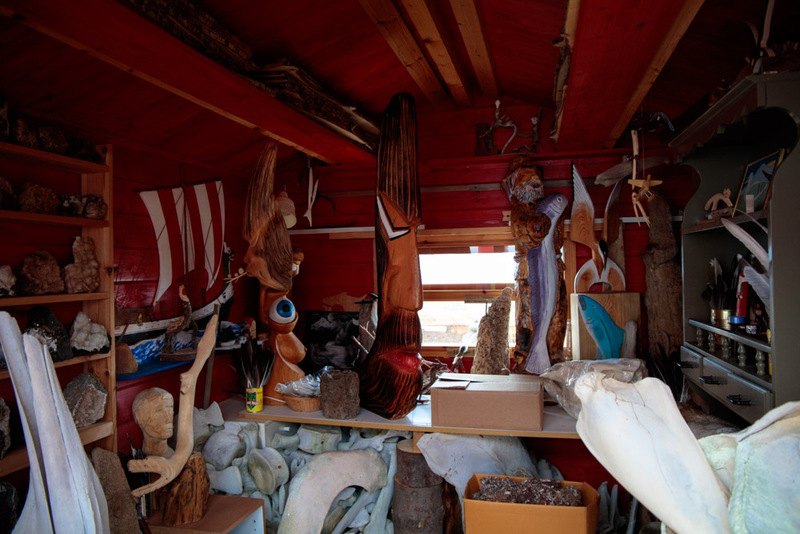 The garden, house and greenhouse are full of stuff, he even has a totem pole. The eastern fjords are one of the best places to spot reindeer. They are not native having been introduced in the 9th century as a gift from the King of Norway because the people were starving. Unfortunately for the reindeer they were all eaten and had to be reintroduced again later. We did see a few at great distance so I did not get any good photographs of them. 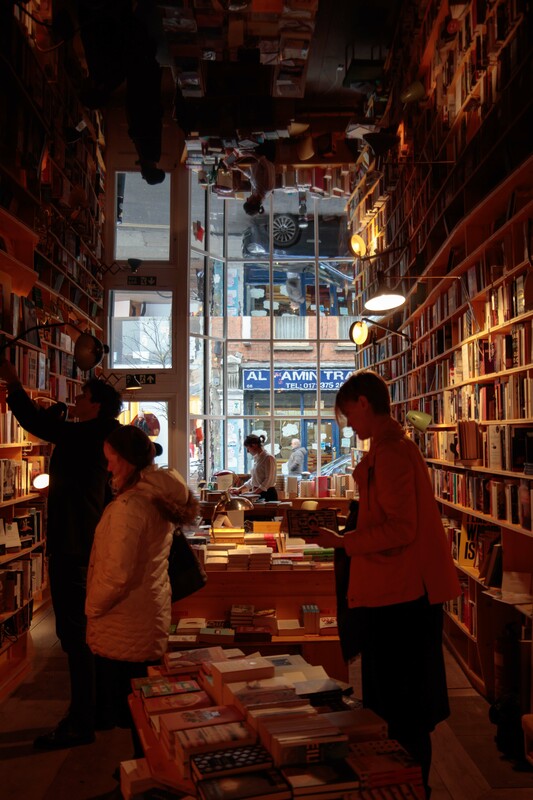 Afterwards, we walked to Spitalfields and visited what has been described as ‘London’s newest and innovative bookshop’. Libreria opened in 2016 and the books are organised in a very idiosyncratic way with some mini-collections curated by different people. They also hold events from time to time. When I came to pay for my purchase, two attempts to do this electronically failed due to problems with their broadband and I had to use cash. This was quite a surprise as I am used to very slow broadband speeds at home but did not expect to find this in London. 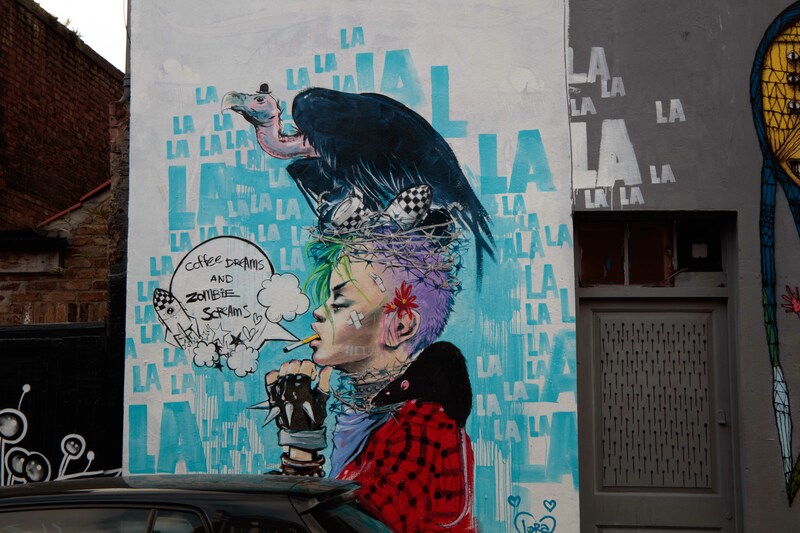 Spitalfields has lots of street art, curry houses and vintage stores on Brick Lane which warrant further exploration at some point. 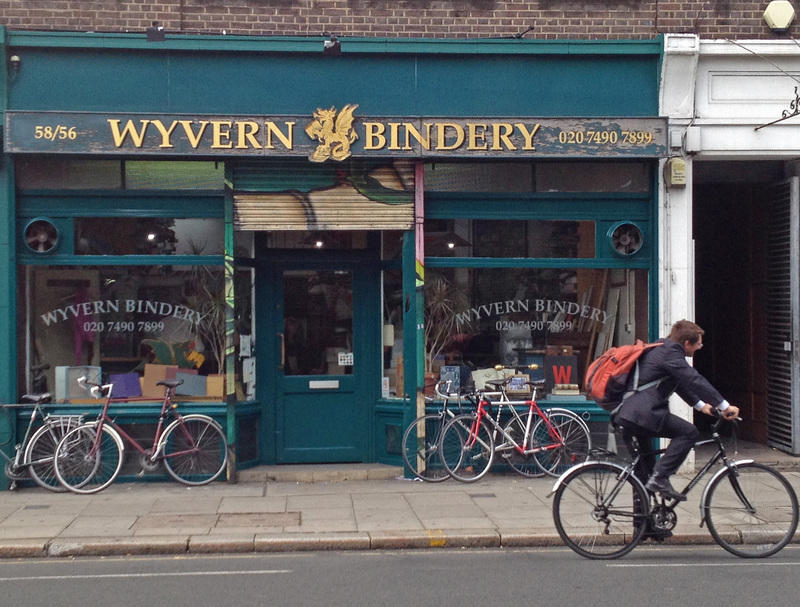 I find specialist shops fascinating and spotted this bag shop on Commercial Street. On the way back to Euston I called in at Skoob Books in the Brunswick Centre. 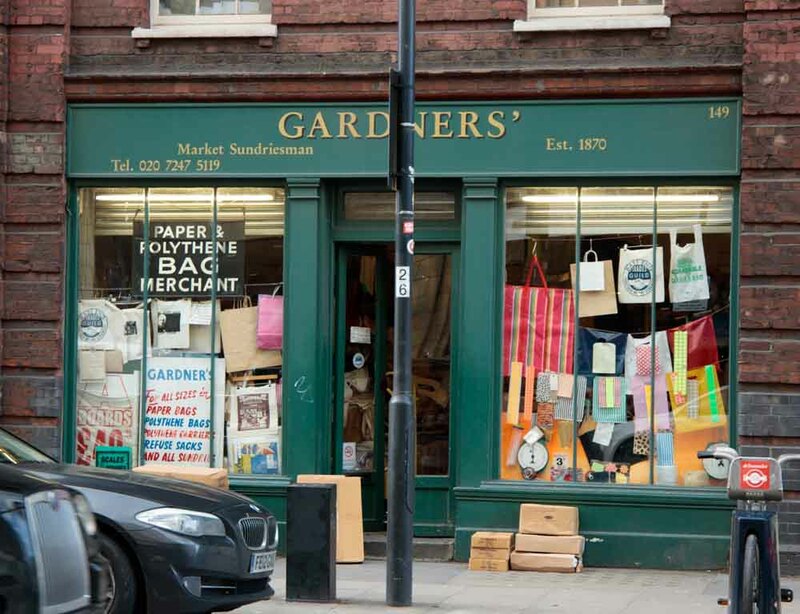 which claims to be the largest secondhand bookshop in London and found a few books. I have never been disappointed here> they once gave me a bag as I was such a good customer. Roadside sunflowers accompanied us much of the way on Route 66. 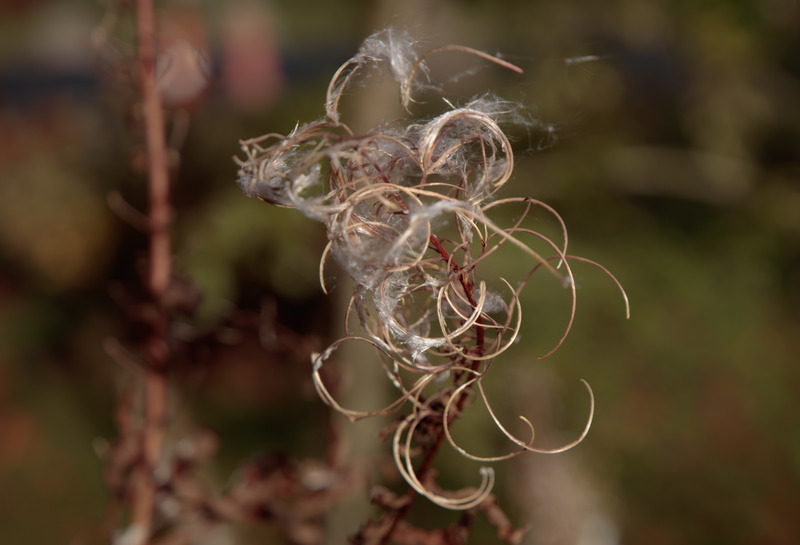 On Sunday’s southbound journey it was the seed heads of Rosebay Willowherb (known as Fireweed in the USA) which waved in the wind alongside fields, moors and forests. We had spent the remainder of our time in Edinburgh catching up with a few things in town and cleaning the flat. 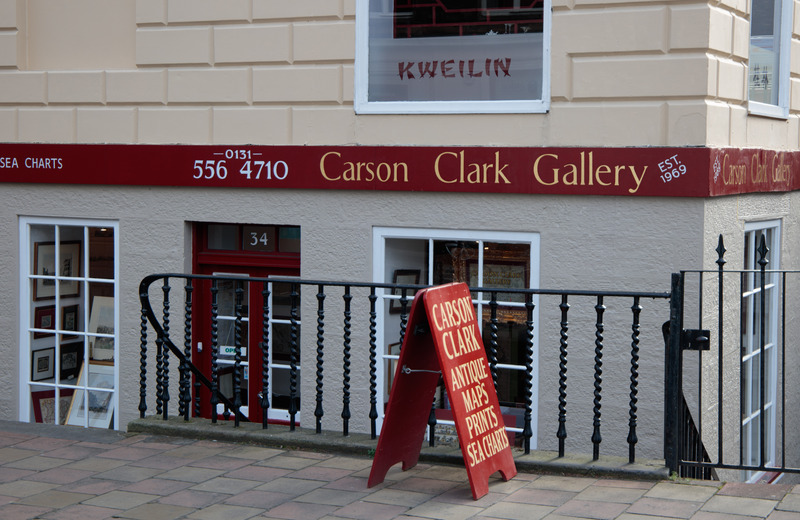 One of the antique map sellers who used to be in the Canongate (the Carson Clark Gallery), then St Mary St, has moved to the New Town on the corner of Northumberland Street and Dundas Street. He is next to the Wally Dug, a pub that has been serving there since 1811. Chatting to the proprietor, we discovered that the reason behind his move was that his previous landlord had doubled the rent. 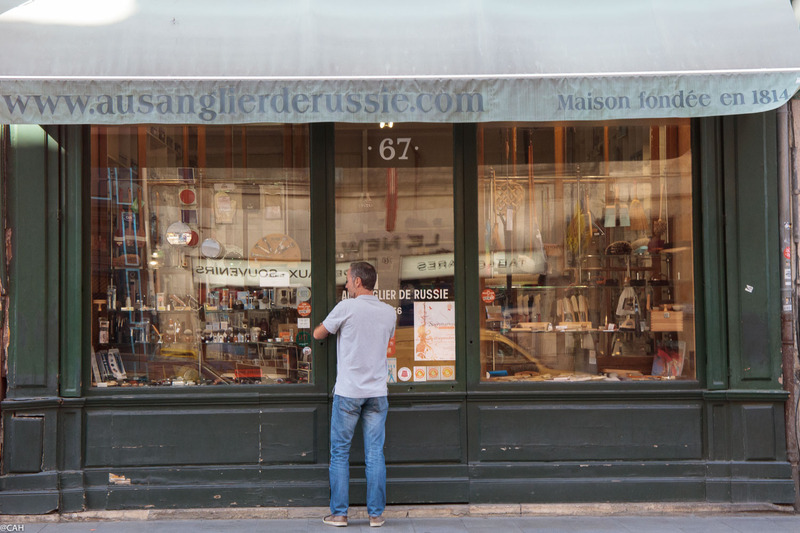 He said that his business had been replaced with shops selling ‘tourist tat’. 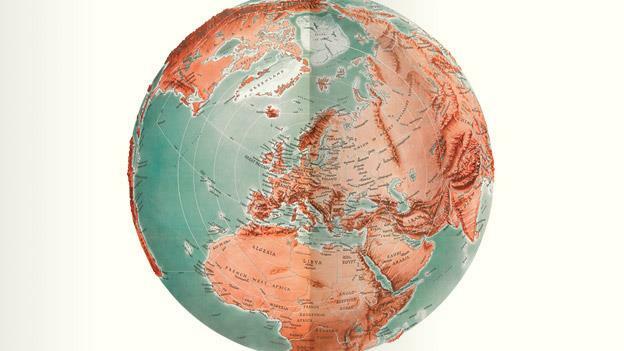 We browsed for a while but with diminishing free wall space, did not buy any more old maps. We did find several books and some more music in Stockbridge and fortified by coffee, then walked back up the hill to the flat. After a rest, we were at the Filmhouse to see ‘I, Daniel Blake’, a very powerful and emotional film that our government should see. Rain was forecast for most of the East Lothian coast on Sunday morning so a beach walk was out. We drove south towards Peebles and could see snow on the top of the Moorfoot Hills. It arrived a couple of weeks ago in the Cairngorms and last weekend the Cairngorm Mountain Rescue team were out. Driving through Traquair, we heard the travel news on the radio announce the first road closure of winter due to snow: the A939 between Cockbridge and Tomintoul. Later we heard of ferry cancellations between Oban, Barra and South Uist. I was interested to revisit this road (the B709) as it will be on my Smallwood to Edinburgh walk which I am planning to do in around 18 months time. The Gordon Arms Hotel by the Yarrow River and Mountbenger will be one overnight stop. Before we reached Eskdalemuir, there was a sign warning us of red squirrels crossing. We did not see any but did come across several buzzards who were feeding on a road kill while others were flying overhead. We also saw lots of pheasants by the roadside and James spotted a red grouse. 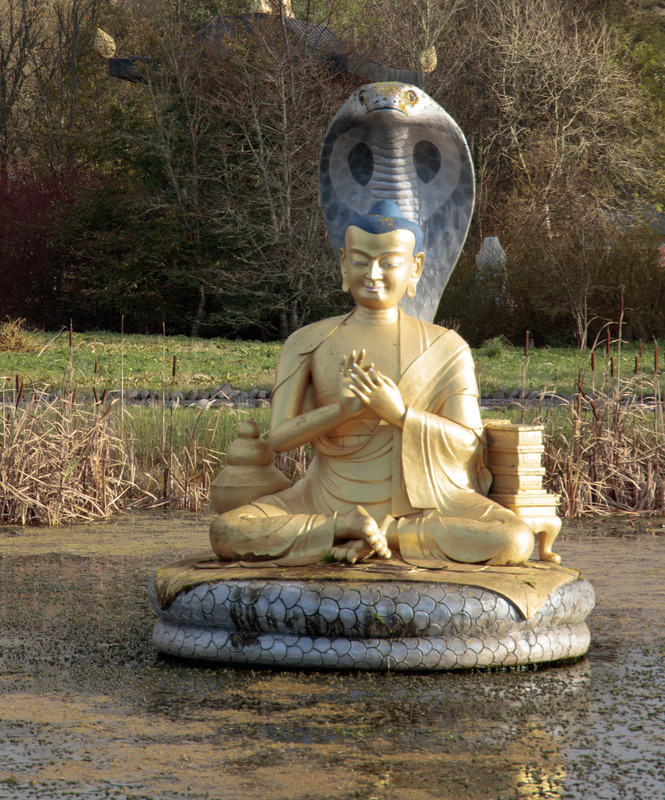 One of my long walk stops will be at the Samye Ling Monastery,a centre of Tibetan Buddhism in the Scottish moors. Scaffolding was covering the Stupa today so here is a shot of the Buddha. The Fairy Hill opposite the monastery also has a shrine but exploration of that and the rest of the monastery will have to wait for another day. Continuing southwards towards Langholm we heard that two mattresses had fallen off a vehicle on the M56 near Manchester Airport so the road was closed. James commented that perhaps they had been to Ikea, reminding me of a trip many years ago to the Ikea store at Warrington. James was too mean to pay the delivery charge so I was hanging on to flat pack bookshelves that were sticking out of the sun roof on a very windy day as we drove across the Thelwall Viaduct. We did make it home without mishap on that occasion. Langholm has a racecourse but nothing was happening on a winter Sunday afternoon. We were soon back on the motorway and home to continue planning our travels in 2017. 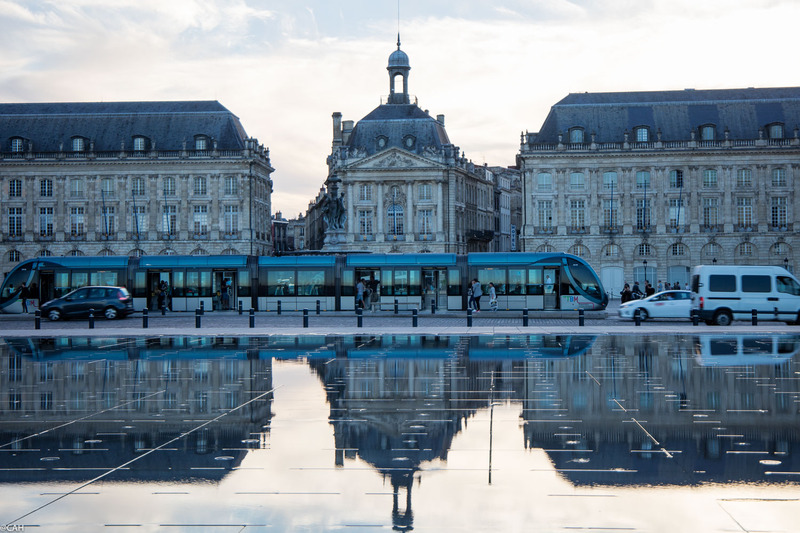 Yesterday, after a lazy morning getting ready for today’s departure, we took the bus into Bordeaux. We were there two years ago and once, more than 10 years ago but on both occasions, drove in. The bus terminus is at the Place de Stalingrad. Just before it is reached we passed the old railway bridge which sits alongside the current one. The unused one was designed by Gustave Eiffel and the city has been told that if it is demolished, it would lose its UNESCO World Heritage Status. It would make a great foot and cycle path and could be planted up like the New York High Line. We walked across the Pont de Pierre to the quayside. and visited the Basilica of St Michael, a gothic church with ancient and modern stained glass. 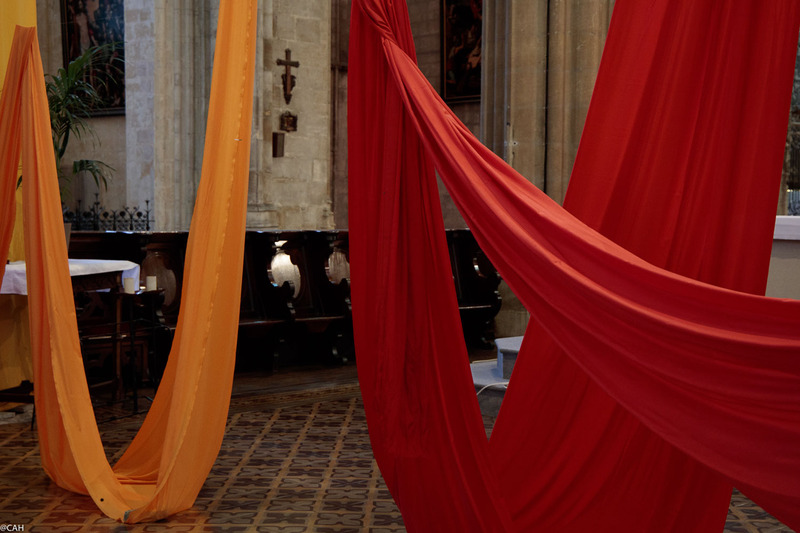 These hangings were striking but there was no explanation or attribution to any artist that I could see. Afterwards we walked around many small streets. 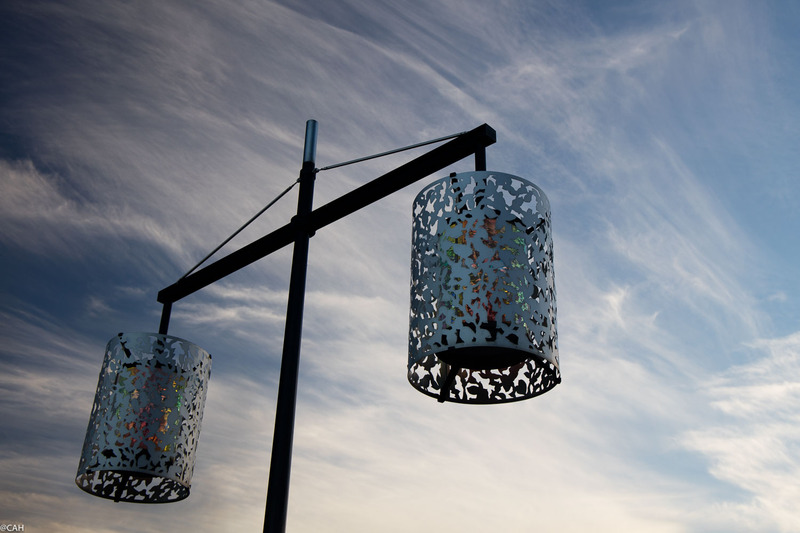 The Marché des Capucins is unfortunately closed on Monday as are many shops in France. However, this specialist brush shop was open. The owner was just returning after a short break and we made a purchase. Before my next visit I must check for any missing paint brushes because I don’t think I have seen such a large selection even in an art shop. After browsing in Mollat, the second biggest bookshop in France, we walked back along the quayside where a huge ship apparently owned by a wealth Russian was moored. 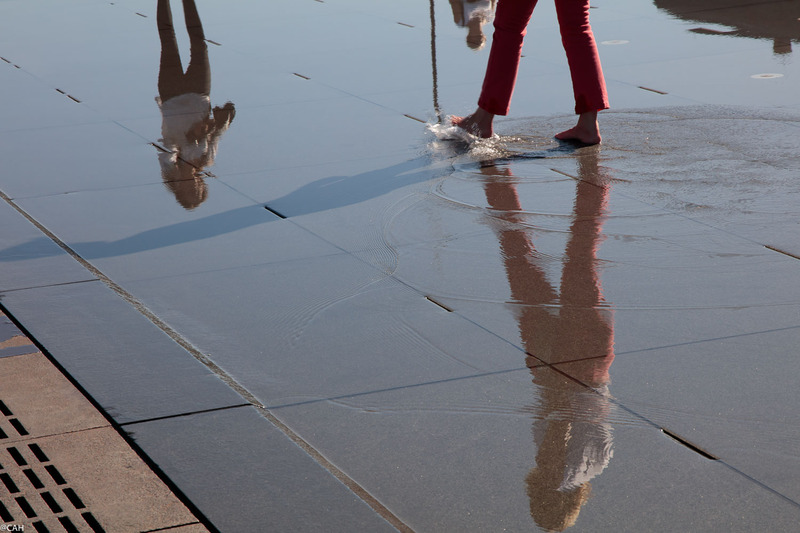 As it was hot, many people were cooling off in the Miroir d’Eau. As the lanterns were beginning to glow, had an aperitif in the Place du Parlement and our evening meal at the Cafe des Arts which is in the art deco style. On the first floor, the ladies toilet has 1930s photographs and outside, on the landing are displays of dead insects from Thailand, Malaysia and other places. Quite a strange combination. This short exploration of the city only served to whet my appetite to return in the not too distant future as there is still a lot more to see. We returned home today and with not too large a drop in temperature to 20 degrees and still plenty of sun. I am not sure how long it will last. The weekend began with books. An early train got us into Euston just as the rain was easing. 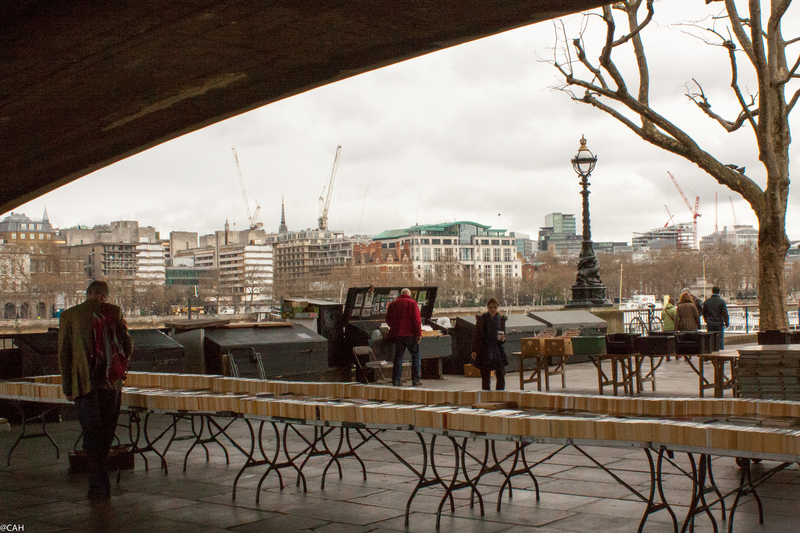 Wandering down to Waterloo Bridge and over to the South Bank took us to the book market there. Secondhand booksellers are not renowned for being early risers and they were still setting up so we had a coffee and watched them get organised and the rest of the world go by. My only find there was a small volume for James’s Christmas stocking which will remain a secret until then. There were some maps and prints but nothing that grabbed us. Later we made a decision not to go into the Map House in Beauchamp Place as we had only recently bought some 17th century maps and are running out of wall space. 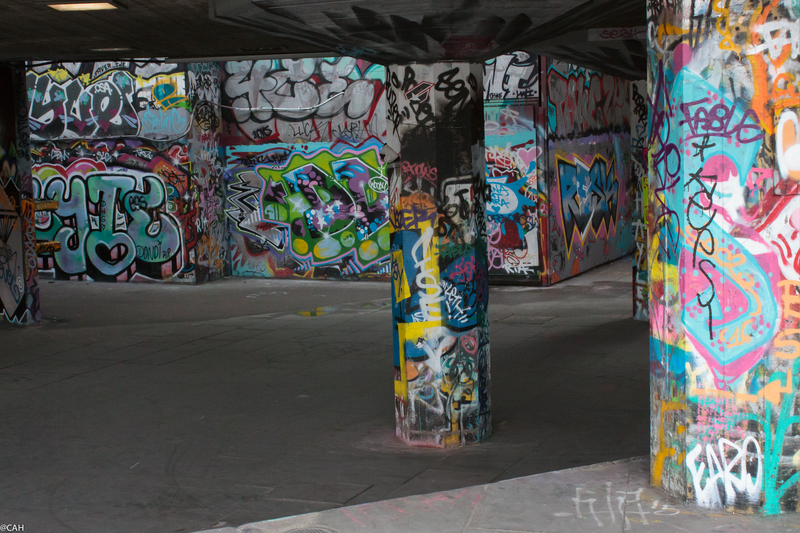 South Bank Undercroft Skate Park was saved from development a couple of years ago but we were too early for skaters today. Back over the river we had to avoid crowds gathering for a parade and various demonstrations converging on Downing Street. St James’s Park was a welcome relief with cherry trees in bloom and the chance to try out my new camera on the birds there. Female coots were sitting on their nests while some of the males were having a bit of a sparring on the water. 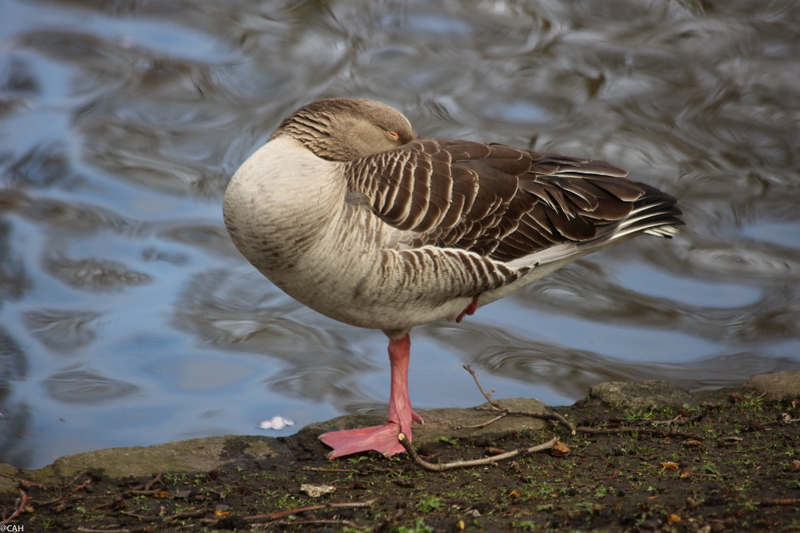 This goose was having a rest. I had thought about seeing the Wildlife Photographer of the Year exhibition but the crowds waiting to get in put me off, so we headed back for a rest after lunch via one of my favourite bookshops in Bloomsbury where we did find some reading material. In the evening we headed to Soho for some Chinese food. 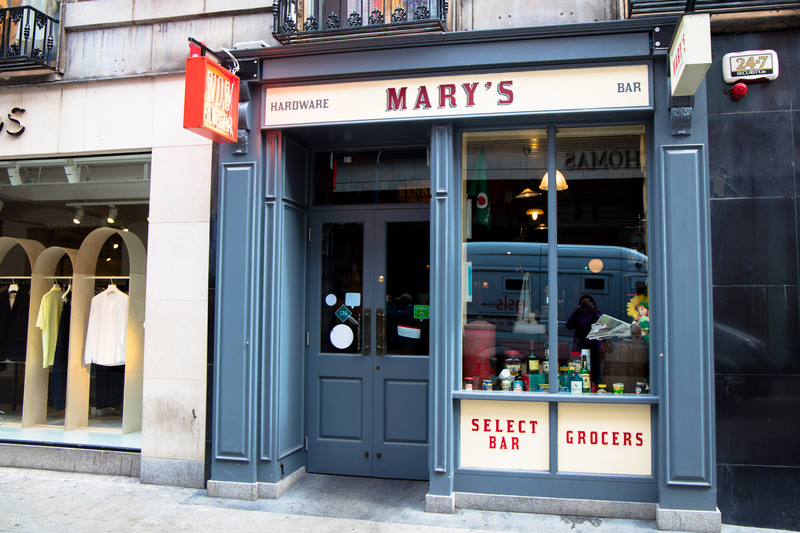 Had I not been so tired after a busy couple of weeks and a virus, I would have been tempted by craft gins and live music as an aperitif but not this time, I also had to walk past Ronnie Scott’s and other delights. 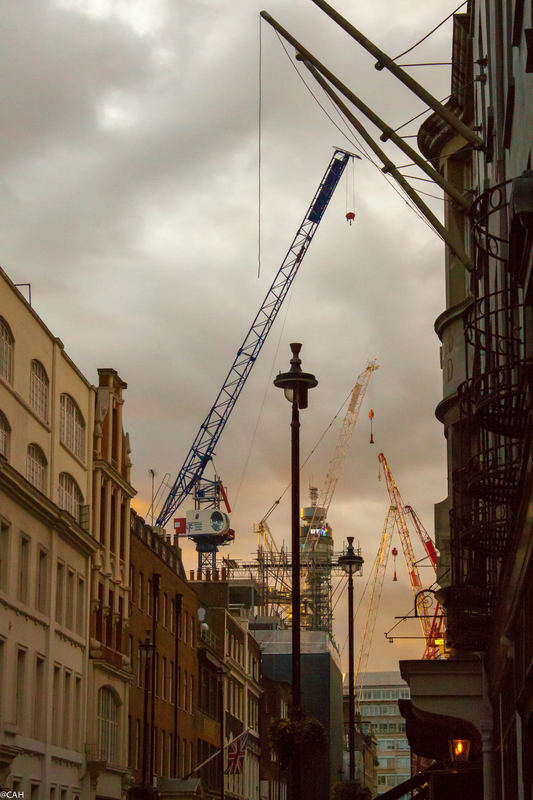 London is still full of cranes (the mechanical sort, not the birds) and I enjoy spotting specialist shops. 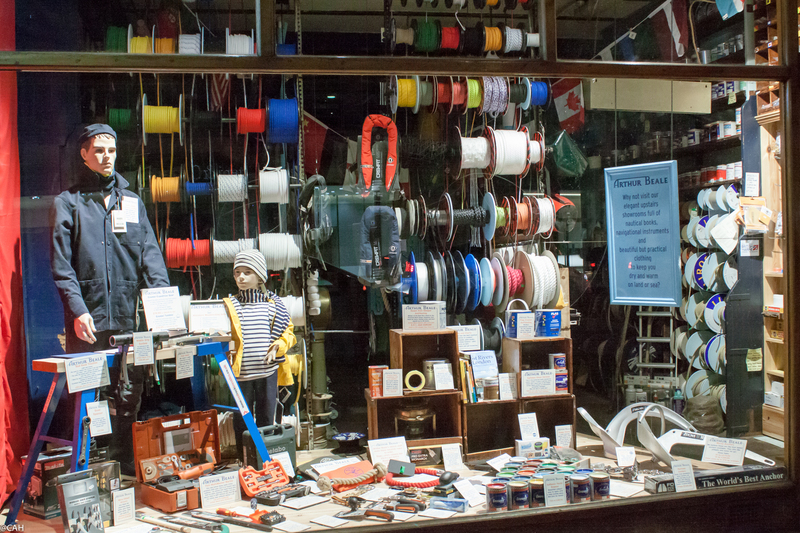 If you cannot find a rope for your boat in this chandlers, you don’t deserve to be on the water. On our last day here we decided we were not going to any more major attractions as we have had our fill of security checks and queues. There will be plenty of airport security checks tomorrow and on Thursday so a day free of them is very welcome. 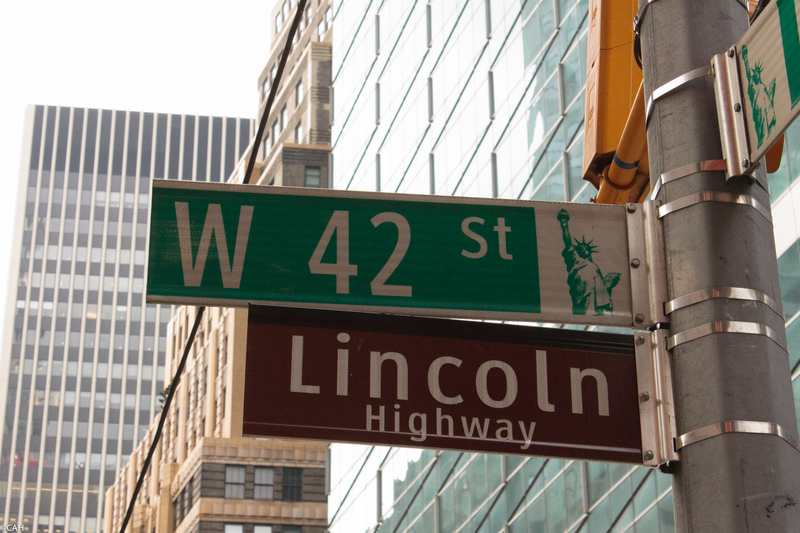 My first task was to get a good shot of the Lincoln Highway marker as I was not happy with the one I took a couple of days ago and James will not be happy to divert and stop at this busy corner when we are crossing Manhattan in June. Wandering around I enjoyed seeing all the specialist shops, one for trimmings (passementerie) and this bead shop. It was a good opportunity to find some things to put on the cuff-link bases that I found in craft store last year and promised to make some cuff-links for James. 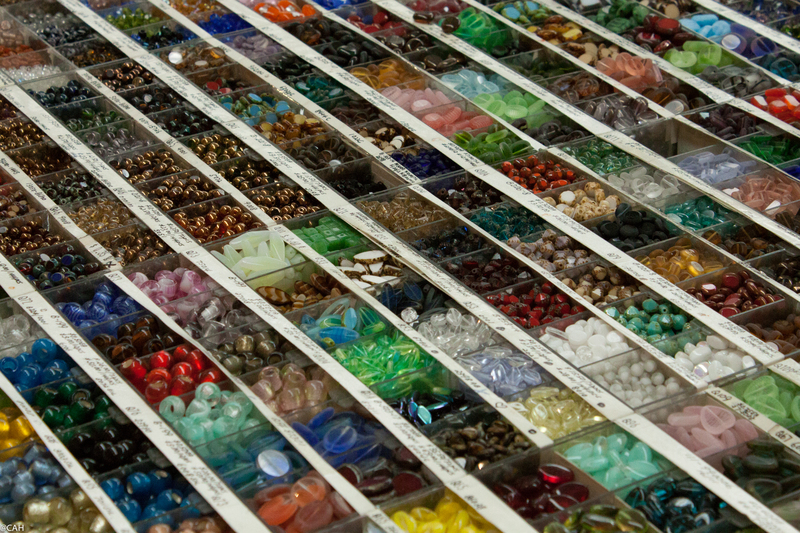 I don’t think that I have ever seen so many beads in one place. Today was considerably warmer and it’s hard to believe that it was snowing only a few days ago. The stalls and buskers were all out and folks relaxing in outdoor cafes. 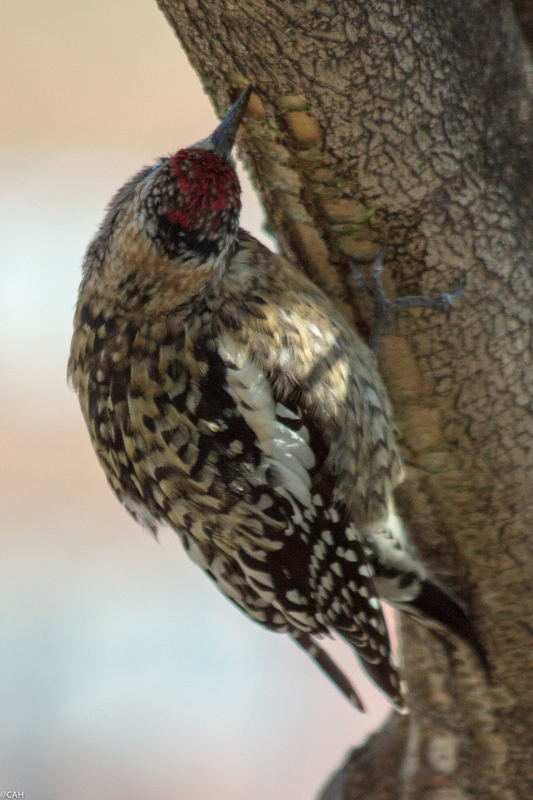 On our way past Union Square to an indie music store I had found, I spotted this Ladder-backed Woodpecker on one of the trees. The Audubon Bird app on my phone is very useful for North American bird identification without having to carry a book around with me and also means that I can log a sighting. Now it is time to get organised as tomorrow we start our journey home, leaving a city like many others, full of extremes. There is a soup kitchen next to the hotel, homeless people on the streets and some empty shops but also endless new buildings and renovations and of course, Macy’s here, is the largest store in the world.